This post is sponsored by Paradise Meadow Cooking & Baking Cranberries by Decas Cranberry Products. Thank you for supporting the brands that keep The Kitchen Paper up and running! 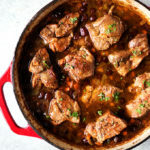 Have you guys every braised pork before? If so, you probably know where I’m going with this. If not, ummmmmm SRSLY TRY IT! 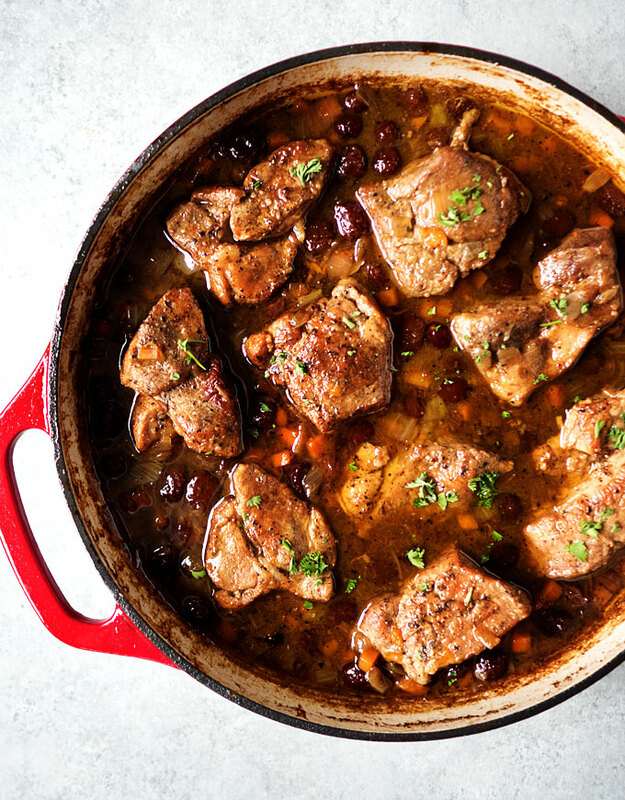 Before conceiving the idea for this recipe, I’d never actually braised anything. Ever. 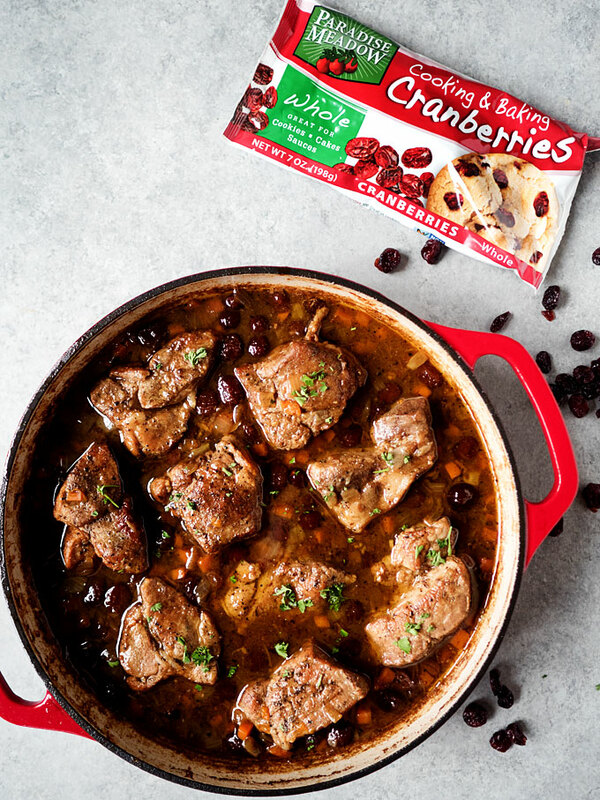 But I have a great pan for doing so, and this recipe popped into my brain as I was thinking up great ways to use Decas Cranberries, and OMG IT WAS SO SOFT AND DELICIOUS! I’m a total braising convert now. What is braising, you might ask? It’s basically like slow cooking something, in liquid, with a lid on, in the oven. All of the = crazy moisture. Super soft meat. Delicious flavors and all the tasty sauce! 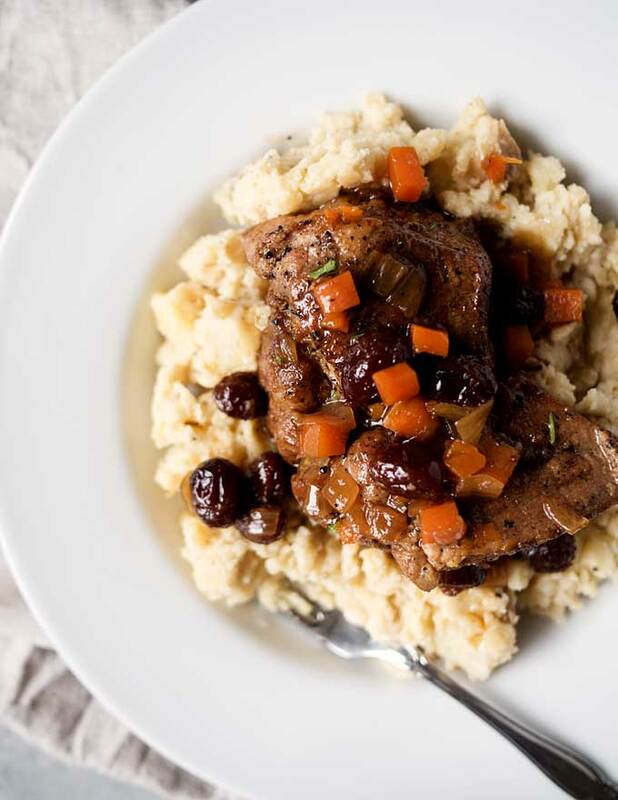 We ate this dish with mashed potatoes and gravy and it felt like a holiday feast for kings! On a typical Sunday night … not too shabby! Here’s the basic rundown of this recipe: salt & pepper your meat, then brown it on all sides and set aside. Cook your aromatics, add broth and spices and treats (maple & cranberries), add the meat back in, then put a lid on it and stick it in the oven for a few hours. That’s it. That is IT!! Pretty quick to get it all put together, then it simmers away nicely in the oven until it’s done, and you get to enjoy all the wonderful smells and then eat the most tender meat EVERRR. If you don’t already have a certain holiday meal planned, this would be a GREAT choice! Generously season the pork with salt and pepper, and heat a large shallow pan (with a lid) over high heat. Using tons, brown the meat on all sides, working in batches and setting pieces aside when they’re done. As soon as the meat is browned, lower the heat to medium and add the olive oil, butter, onion, garlic, and carrot. Use a wooden spatula to scrape up any brown bits stuck to the pan. Once the vegetables have begun to sweat, add the broth (another good opportunity to scrape any brown bits off the pan), bay leaves, and maple syrup. 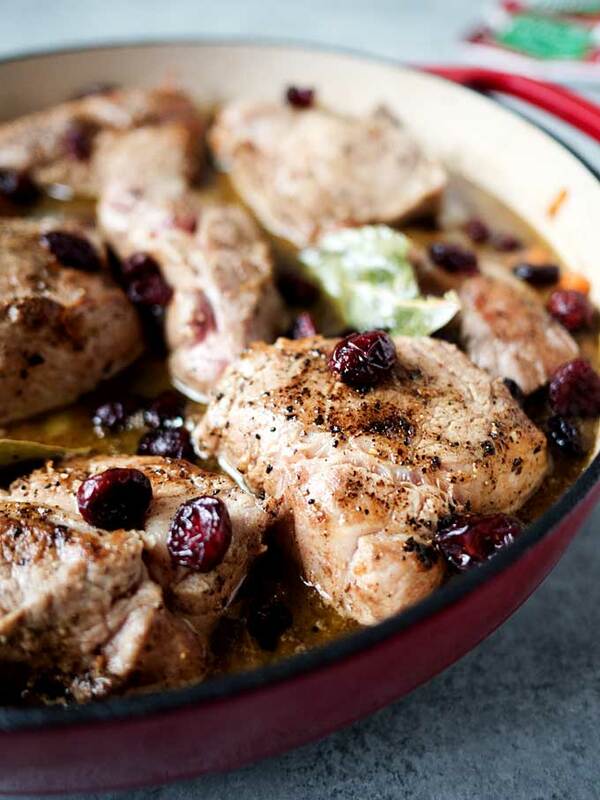 Bring to a gentle simmer, then add the meat back into the pan in a single layer, along with the cranberries. Make sure the liquid is not fully covering the meat, but is more than halfway up the sides of it (mine was nearly to the top). Cover the pan, and place into the oven. After 1 hour, flip the meat. Continue to cook for 60-90 more minutes. Serve warm with the sauce from around the meat!